Toe care that is actually known as pedicure was done from past 4000 years. Care for hands and feet are very necessary now days, it removes dead cells from the skin and gives fresh look. Nail art is done on the finger nails and the toe nails for providing more grace to them and to make it more unique. Different type and different kinds of nail art’s are introduced. Nail art for summer, winter, beach, parties, weddings etc are very popular among young girls, because young girls want to make their nails unique. Every year thousands of new nail art designs are introduced for finger nails and for toe nails too. People don’t pay much attention to their toe nails in winters because, they think their feet are not going to exposed but in parties and at any big event they feel embracement when they look at their blank nails. Not just in summers, but in winters too it is necessary to color your toe nails. For winter season warm, deep and sharp colors are good. I recommend girls to choose the vibrant color and match it to your skin tone. Don’t hesitate to try new things on your nails, and if you don’t feel comfortable remove it and bring some other color on it. One should know that which color suits her nails and which not and then decide to do the nail art on her feet with the best color contrast. Tip: Choose light nail colors for darker skin tones and for brighter and white skins, I recommend to choose bright colors. Nail art shows your creativity and also showcase your fashion to others. The best part of nail art fashion is that you have full control on this fashion, you can either make patterns, use stickers, use different tools, jewelers and pearls to decorate your nails and it is not necessary to copy other nail art designs. One can think for the best nail art design and do it on their nails. The actual purpose of nail art is to fancies and to make nails more attractive. There are many varieties in toe nail designs for winters that will blow your mind. Some people love to design their finger nails and toe nails with the same nail art, and some of them want to differentiate the design. Here I am discussing top 10 toe nail designs for winters that will be fit for any occasion and you’ll love to do on your toe nails. Girls love to be classy either it's summer or winter. The word classy specifies that the designing should be neat and very precise. In this nail art i use simple patterns theme with black and white, other nails are painted with peach color. One can change colors according to their choice. This nail art is classy because the design is precise and one can easily understand this design. 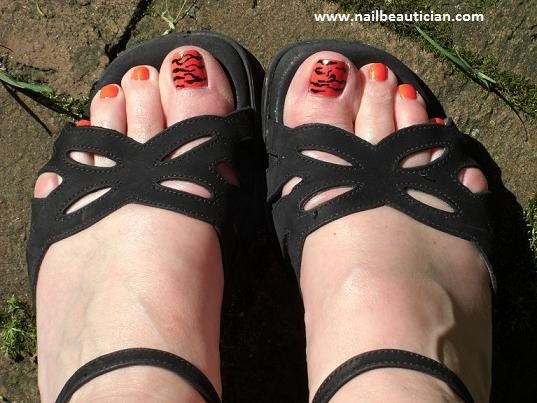 As the word "easy" describes that this toe nail design is very easy and any one can copy it to their nails. Young, small, old woman anyone can try this. Just with the darker base as i choose the black color and make polka dots with the help of dotting tool or cotton bud, one can design their toe nails easily. These are the perfect nails for outdoors, home, and for any party even. As i told before, in winters hot and dark colors are best. But choose the color according to your skin tone. Darker shade nail colors are not best for the darker skins. In this toe nail design i simply use the glitter red nail color and put small beads in line shape. You can change the shape and nail color. This design is perfect for the winter weddings, especially for the brides. 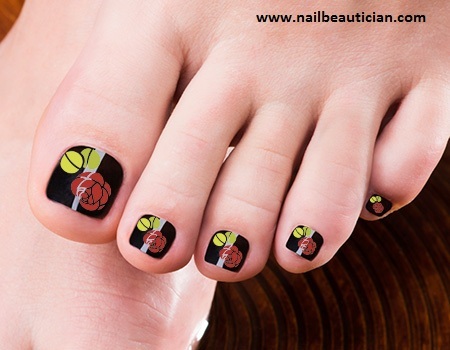 Make your toe nails look more beautiful and elegant with this flower toe nail design. This design is bit complicated for the beginners, for making it neat and clean. Nail art pen tool is required for this nail art and draw the flower shape on your toe nails. Choose the brightest nail color for best outcome. This toe nail design is recommended for the young girls, who don't want to fancize their nails more. We mostly see that girls done jewellery nail art on finger nails. But the trend is changed and now they do this nail designing on their toe nails too. It is here recommended to choose the jewellery that will stay on the nail for long period of time, because while putting shoes and sandals on your toe it stays on. This kind of toe nail design is good for parties and wedding. Experties is required for this nail art. Winters are famous because of snow man, people love to make snow man's with snow. In this nail art i use white stripper to make cute snow man and for giving snow effect i use toothpick. This toe nail design is good for the young girls and for the kids too. It gives a cute effect and also it is just for the winters. So design your toe nails with this amazing design. This is another amazing winter toe nail design that is very famous among the office going girls, because it is descent design. This is also the most easiest nail design. I just paint all the nails with red nail color and on thumb simple draw horizontal and random lines with black stripper. It can be carried by anyone and no special training is required for this nail design. In this design i try to give a proper effect of winter's. I named this toe nail design "leaf" because i make proper leaf with white stripper on the maroon background. It actually gives the gorgeous winter scenary that is outstanding. I recommend to have this toe nail design in winter season. This nail art is also amazing and gives your feet nails a unique look. I use black nail color on all nails and paste a sticker of rose flower on all nails. Different kinds of stickers are available in market, one can choose according to their choice. This nail art is trendy, one can carry this design in parties, weddings, and in daily routine. This toe nail design is very colorful as i use top hot winter colors in this design. To make this design unique i make half wheel with the help of white nail color. This nail design will look good on girls. It is the easiest and the trendiest toe nail design.